until the 19th of December that is - to put the christmas tree up and all the decorations. I love Christmas and I am so looking forward to decorating the house as it will be our first Christmas here. But I love the anticipation - the build up and the excitement when it all happens. But not too early. It has to be the week before - it all makes it more special to me. So I had another productive day in my studio on Saturday. 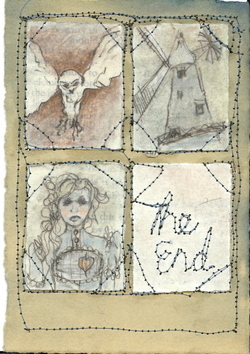 Above is a new aceo set which is now available in my shop. This week I am preparing for the craft fair in Manchester on Saturday (the last fair was a great success I think!) as well as the local art exhibition I am involved in with Sneinton Artists at the windmill which is on Saturday and Sunday. So a busy week ahead for me. 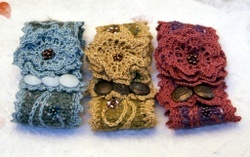 Making, sewing, crocheting, printing business cards and price labels, framing....busy, busy, busy. Here is another drawing completed at the weekend. Even I dream sometimes (not sure about the title) may go in the exhibition this weekend. I am not sure yet. I am drawing close to my 100th blog post which is very exciting so I am hatching a plan for a giveaway on the 100th post. Keep a look out for that! Ok it is late and that is all I have energywise! Hopefully have some in progress shots tomorrow as well as a much more interesting post! No post from me yesterday - I am really not doing well with the NaBloPoMa challenge. There is a reason but I shall moan about it tomorrow. Today I shall just say Happy, happy thanksgiving to all who are celebrating it today! I just thought today as a way of doing a little UK Etsysellers promotion - I would utilise the fabulous etsy poster sketch tool and put together a few of my favourite gift ideas from the UK. Bearing in mind the last mailing dates from the UK (dates listed below) - it is time to get those gift lists out and do some shopping! I am planning on putting together a few of these lists over the next couple of weeks - it is also giving me plenty of ideas too as well as coveting all the beautiful items I would love for myself! Soo the last dates for posting in time for Christmas from the UK are : 7th December (USA), 13th December (Europe) and 17th December (UK). So there is plenty of time to get those orders in for Christmas no matter where in the world you are! Sorry for the uninspiring blog title - and this is just a quickie as I haven't picked the best time for blogging - but I was just desperate to show you this new piece which I just finished today. Isabels dream of life and light - and I have to admit to feeling more than a little pleased with her. You can see a couple of detail shots over at my flickr page. Again this is another to be put aside - but hopefully I will be getting prints of all these latest pieces in my shop soon. I also made and listed a new aceo set over at my etsy shop - which is actually starting to look rather full! Thank goodness as over time I have often struggled to keep up a decent inventory. 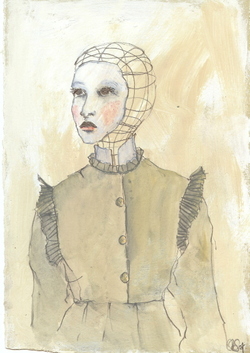 I am really enjoying making these aceo sets at the moment but there are sure to be a few single ones appearing too. I think I may be editing a few pieces out of the shop soon - just a couple of prints and postcard sets that I feel may have run their course and perhaps are not on par with the rest of the work in there. However I shall be sure to let you know first should anyone wish a print before I relegate it to the back cupboard never to be seen again! I have a hospital appointment tomorrow - can you believe this is me only getting the results of the scan on my back that I had at the end of June!!! Well it is just aswell it's nothing serious hey! a much anticipated cinema trip to see Elizabeth: The Golden Age - visually stunning - of course I was in awe of the costumes but I did feel distracted by all and consequently did not feel the actual script and story stood out enough. Well worth seeing though. and I am sure alot more besides - well that was our weekend. Gone in a flash. But now I am ready to start a new week and gosh do I have alot to do. I am working from home today as I have more costume commission pieces to finish (just small jobs but they help with the pennies) and then I will spend the rest of the day making for the up and coming craft fair which is in just under 2 weeks. Above is another of the pieces I finished last week at my studio. 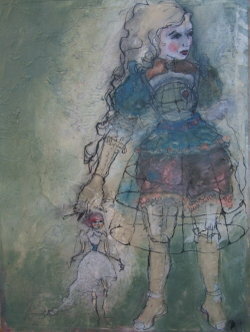 'Oh to be a Sailor's wife' - another peice which is being put aside for the moment. Can you tell I am drawn to the sea and the emotions surrounding it at the moment? I just can't get enough of it. 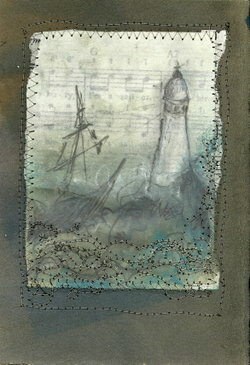 I just want to draw lighthouses and shipwrecks and those crashing waves. 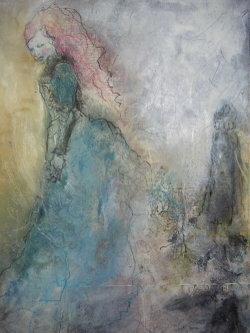 Also women with red hair - perhaps this is in mourning as mine is going quite grey at the moment! Anyway off up to the loft space for me! I have a couple more cuffs to list later on today - one in a colourway which I am just so in love with - it will hard putting it in my shop! I just hope I can get enough light to photograph it as is rather a dull day. We even had snow for a short time last night! Oh my goodness I had a whole post of pictures to show you today but it is now after midnight and I have had a long day at my studio and I can't keep my eyes open! So instead I shall just show you these 2 small mixed media pieces which I have just listed in my etsy shop (why oh why must listing on etsy be such a laborious task!!!) 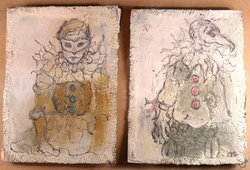 along with 2 new aceo sets here and here. 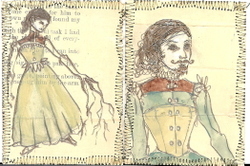 I think Jupiter and Juno might be my favourite aceo's I have done for a while. 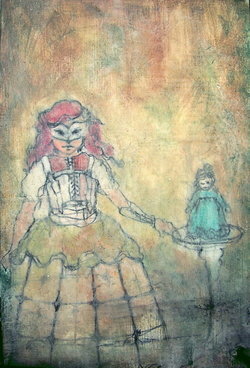 I had such a productive day at my studio today - finishing 1 piece on canvas board; starting another puppet themed mixed media on paper; along with the new pieces in my etsy shop. I particularly love A story in pictures (see above) after having the idea that so much of a piece of art is dependant on the viewers interpretation - they can imagine their own story which may be completely different from that of the artist. I am hoping to explore this further with more work. The piece here is Oh to be a sailor - continuing with my fascination of shipwrecks and the effect on husbands and wives - those at sea and those left behind. Ok off to bed for me! Good day to you this cold Wednesday! Well after my epic post of last night in which I initially stated that this would be a week of short quick posts - I am making no statements or promised in this one! I have had a wonderful day at my painting studio - again following my routine as mentioned in yesterdays blog post of writing, sketching and journalling I this morning found myself adding another element into the mix. For a while I have been wanting to get back into sketching people. At present I cannot afford to attend life drawing classes and it is not always easy to sketch people in public places - Although it is something I have done in the past it can feel a very self conscious thing to do. It is also difficult to do without your 'model' becoming aware of what you are doing! 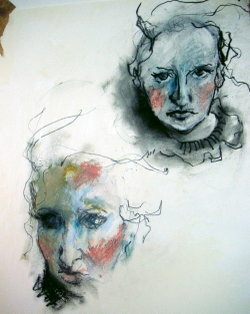 I can find faces very difficult to draw - most of the work I have been doing lately the faces have been out of my own head. But at present I am feeling a desire to get back to basics. To get back to the heart of drawing. 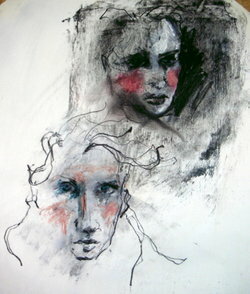 I have been thinking alot about my 'own style' and how this relates to the art that I admire on a daily basis. 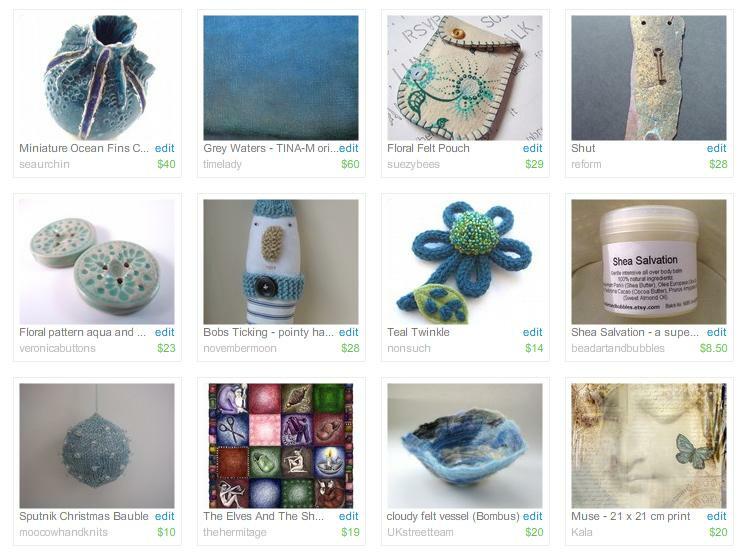 Sometimes it is difficult to not be overly influenced by all the art I look at on blogs, etsy and other places. Although I greatly admire all the wonderful art out there, I really want to retain my own individuality in this. To express what is in me. So what better way to do that than to study my own face! Now I don't think I have even drawn a self portrait since I was at high school where I actually created a large amount of them. To tell you the truth at the moment I do not even look in the mirror a great deal! So my challenge to myself is to draw a 5 minute (or less) self portrait sketch every day that I am at my painting studio. Note that I am not making this a 'daily' challenge as I know I would not manage that But there is no reason why I can't do it whilst I am at the studio. I am excited to see what will come of it. I want to try a whole host of different media and really push my own style as well as challenging myself to think outside of the box and try new things. In all honesty this is not an easy thing for me to do. I will not bore you with details of my insecurities about the way I look, but what better way to challenge myself to feel comfortable with my very own face! 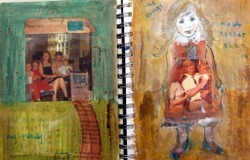 As well as having lots of new subject matter to work into my art. So here the images shown are my first attempts. The top image is 1 and 2 - neither of which look a bit like me! Image 3 and 4 I feel bears a closer resemblance but I am not really aiming for an exact likeness every time - more the 'feeling' that it is me. My moods, my character, the change in my expressions and my daily perception of what I look like and what it is to be 'me'. 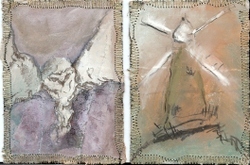 Today I was working on gesso'ed paper with oilbar, pencil and pastels. Can you tell I had a rosy cheeked day?! Oh and the only mirror I had with me was a tiny compact - so this was not the easiest of tasks! I also completed a small mixed media piece (as yet untitled) with a layer of wax to add to the atmosphere and 2 aceo's/art cards. All the artwork I am currently creating is being put aside for a potential 'project' and will not be listed in my etsy shop. Hence the lack of updates in the old art shop. However in order to keep things fresh and stop everyone from getting bored with it I will be attempting to regularly list some new aceo's - these 2 are now residing in my shop as I type this. Look out for more! I have more works in progress to show you tomorrow. This blog is so 'me-centred' at the moment and I do apologise for that! I guess I am just on a wave of inspiration and am enjoying expressing it all. 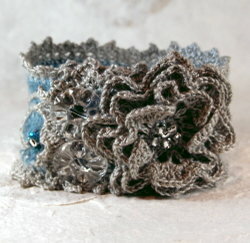 Also listed today is yet another new cuff - all from my production line for up and coming craft fairs and xmas etsy shopping - there will be more variation in there soon! This is a week of short posts consisting of little else but art and craft stuff. Not particularly exciting but it is all I am really up to at the moment! Preparations for various craft fairs where I am both sharing tables and for one right at the beginning of December where I will flying solo; trying to keep my etsy accessories shop in particular stocked up for the christmas shoppers; completing a few necessary but not especially exciting costume jobs (mostly adjustments and adaptations to already existing costumes); all these things are keeping me busy. Over and above these, my list of things to do is crazy long. I should be prioritising the list of things I would like to be doing. Gallery applications; new designs; organising my portfolio; applying for other online selling venues; putting my brain full of ideas into practice. These are all the dream jobs that I never seem to get round to because all the other stuff gets in the way. I have had a couple of good days in the studio where I have indulged in the luxury of just journalling and working in my sketchbooks. Sometimes I find it hard to do this as I feel I need to be coming up with finished pieces - but at the moment I feel it is absolutely necessary. I have so many ideas and fear I will lose them all if I don't get them down on paper. Working on the final pieces will come in time and I am trying to not put myself under too much pressure. However pressure there must be. I have self imposed deadlines and bills to pay. Each day I am at the studio commences with me procrastinating and jumping from foot to foot, wondering what to do. Then I organise my materials and sketchbooks - I like a certain amount of order when I am working and moving all those pencils and bottles of ink seems to calm me. It allows me to empty my mind of all the junk whilst doing what seems to be a mindless and repetitive task. After this I increasingly find myself writing a few pages in my journal - often it is my fears about my creativity, the lack of confidence, all the barriers that are there on a daily basis. Is it weird that I have to go through this every day I am wanting to create? Then comes the good bit - I get out the gesso or the collage papers and I get rid of all that anxiety - it all gets covered up and lost - it just disappears. To be seen no more. Then and only then can I get down to work. I begin writing again, I stick things down, I start to draw. My thoughts pour out, my dreams, my memories, the images that stick in my mind. One idea comes and then there is a flurry - more and more follow - one thought leads to another, words follow on from another and connections are made. This has been the process for the last couple of days and actually pretty much every day that I have spent there. I guess it is only in writing this that I have realised that I follow this process! I hope you don't mind me sharing it with you even as it is revealed to me. 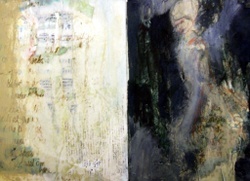 I will be back in the studio tomorrow and I am hoping that I will be ready to begin new work based on all these ideas. I feel it is time. Alot based on family, memories, childhood - all the things that are on my mind. 'The things my grandmother would have told me' - is a phrase I cannot get out of my mind at the moment. I am excited to see what comes of it. I have shown just a few of the pages I have worked on over the weekend and am hoping to have more to show later this week. 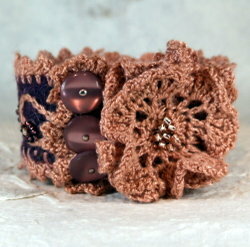 Also there are a couple of new cuffs in my etsy shop with more to come soon. I think I am doing a small craft fair at the weekend so may not list too much more until after that but there is sure to be more later in the weekend and the beginning of next week. Just a real quickie as I am off to bed - it is late here already and I am only just squeezing this post in before days end! 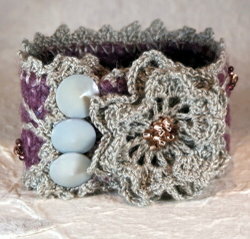 This was a custom order of cuffs which has already been mailed off but I have lots more in various stages of production. I really need to get them all listed on etsy although I also have a couple of craft fairs coming up too so am saving some for those. It is always a dilemma - do I just list everything on etsy and then put what doesn't sell into edit mode for the fairs or do I not list everything and risk it not selling at the fairs but being too late for the US xmas shopping postal deadline? Mmmm what a quandry. I guess I don't mind where they sell - just as long as they do! I do love making these though and I am still in love with the design although I have been making close variation of this for a while and really should be thinking of pushing it forward in some way. I have a few ideas. I had a great day at the painting studio at the weekend - lots of journal writing and sketchbook work - I shall show and tell tomorrow. Just a quickie tonight as dinner is on it's way and I am ravenous. Lovely Moussaka as cooked by Mark then apple and pear crumble cooked by me - Yumm! But I just thought I would pop in briefly (as I am determined to get back on track with the daily blogging after missing a few this week) and encourage to you take the pledge. The Handmade pledge that is. I have signed up (see the icon in my sidebar) and I am very excited about it. Due to limited finances I will be attempting to make most of my Christmas presents this year - however what I cannot make myself I will be buying from fellow artisans, crafters and cottage industries. Of course there are so many reason's for this not least my desire to buy meaningful gifts for which I have given alot of thought and care for the person and not just buy something which they will not appreciate. Also - this year in setting up my own handmade business and as an artist I have such an appreciation of the time, love and effort that goes into making each and every item - not to mention wanting to support fellow crafters.